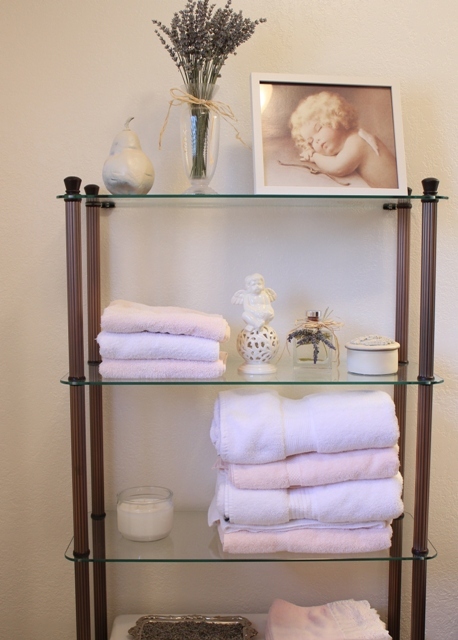 It's a rainy day in Northern California and, I've been inside the house doing a little redo in the guest bathroom. To See Guest Bathroom remodel post in April 2010 go to 'Angel Bathroom'. I was watching Martha Stewart one day and a gardener was showing begonias. Beautiful begonias, just the kind I would love to grow. Martha asked her where did she grow her begonias? She said "In my bathroom" at last the answer to my prayers. And now I have begonias growing in my bathroom. I'm hopeful this idea will work. Out with the Lavender and in with the Yellow Begonias. I bought a large yellow begonia at Lowe's last weekend and, when I got home and looked at the plant closer I found there were three separate plants in the container. Yip-Skip... 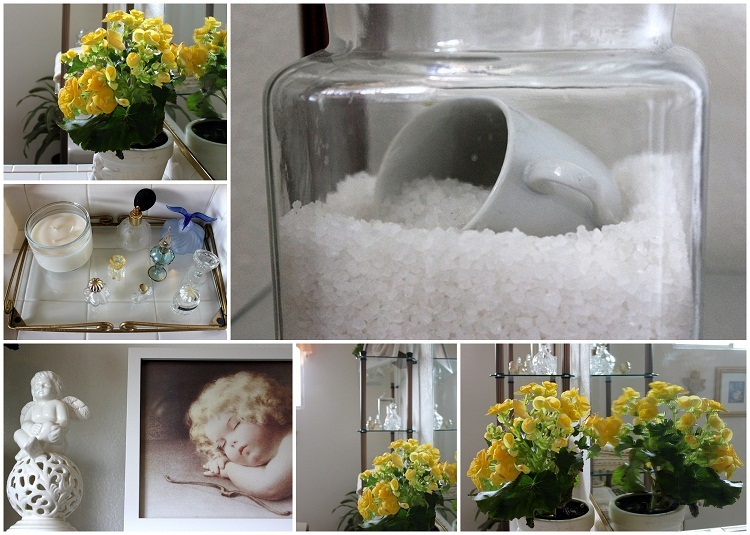 I replanted them and put two in the bathroom and one on the living room coffee table. I also painted two Terra Cotta angel pots so the yellow plants would really pop in the off-white pots. 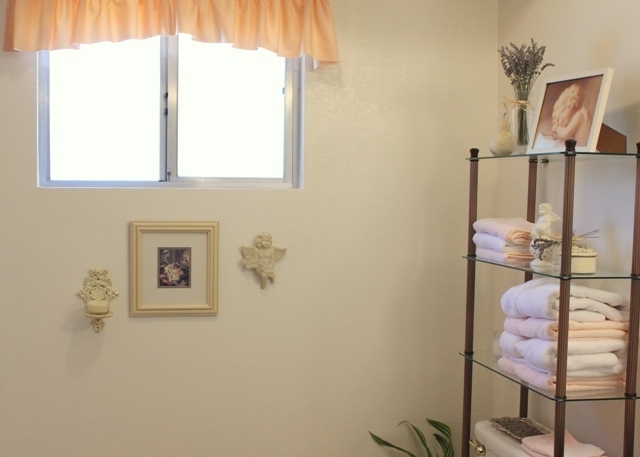 I'm also looking for an off-white curtain for the window to accent the new vintage looking lace towels I fell in love with at TM. When I find the curtain I will share with you another look and, we'll see how the begonias are fairing in the guest bathroom. I still have the same wall decor, but peach is history. Begonias love moist soil , and humid air. I made some bath salts and I found a darling demitasse cup at the GW for .49 cents. My dream is to have the begonia cascading down over the shelf and bloom and bloom and bloom. My sweet angel night light has a soft gentle glow to help guide my guests during the early morning hours. Well off I go to do some more crafty things while it's still raining outside. I love to make mosaics and this one is great with the bright yellow and the soft off-white details. Dear Betty..what a perfectly lovely bathroom. The colors are exactly what I am loving this year. I admit to changing from year to year and season to season. You made your own bath crystals?? How wonderful. I have never taken on such a task! And that tiny little cup to go into the jar? Perfection!! Oh I love your Angel Bathroom, very pretty. Hallelujah with your Begonias. Have a great week. Great mosaics. Yippee for your begonias. They are very pretty! Lovely mosaic and such beautiful Begonias!! Your angel bathroom is wonderful. I love begonias and what a good idea. How luck that there were 3 in one pot. Love the way you used the cup from GW in your bath salts. Fun post!